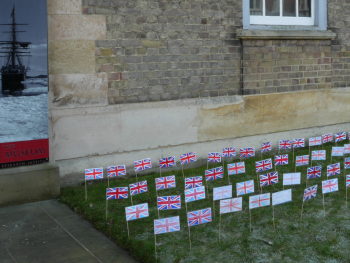 Could you help us to celebrate the day Captain Scott reached the South Pole by making small flags for Pole Day? 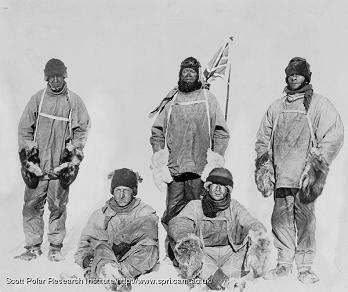 On 17 January 1912 – 100 years ago - Scott and his four companions reached the South Pole. Since then, 17 January has been known as Pole Day, and this year there will be a celebration at the Scott Polar Research Institute with some very special guests visiting. 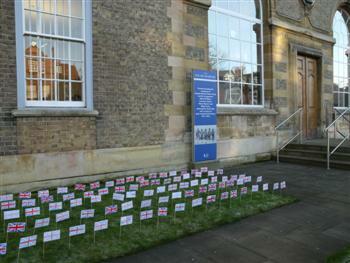 We would like to plant a sea of small flags made by children in the garden at the Institute, for the world to see. On the back of each flag there is space for YOU to write a message or thought for Captain Scott and his men. We are asking you because you may have visited our museum or website or watched the Frozen Planet or read a book about Antarctica and now you know just how extremely cold and inhospitable Antarctica can be – and what an extra-ordinary accomplishment it was for these 5 men to walk to the Pole. We wondered, if you could have sent a message to these men, as they stood cold and hungry on the bottom of the world – what would you say? Your message could be as simple as congratulations or amazing – or it could be a longer thought. We have made a flag for you to colour in, and to write a message on the back. We are happy to laminate them, fold them and staple them to poles here. We really need your flags by Monday 16 January at the latest, in order to get everything ready.